In my three and a half years in Japan, I’ve only had monjayaki once. I thought it was a sad, watered-down, flavoured-down excuse for okonomiyaki. And based on that one experience alone, I decided that I didn’t like it. After all, how dare the people of Kanto blasphemise my favourite Japanese food and make it all gross? And so I avoided it… until yesterday. Life always has a way of surprising me in delicious ways. A bunch of students from one of my classes recommended Tsukishima to me sometime back. I’ve been meaning to check it out – but I just never got around to it. I have a crazy busy work schedule that requires a lot of travel so when the weekend comes around, all I want to do is stay at home and do nothing. And yesterday was no different. But I somehow managed to drag my moody bum out the house. The late afternoon started at Tsukishima Station at 3pm. 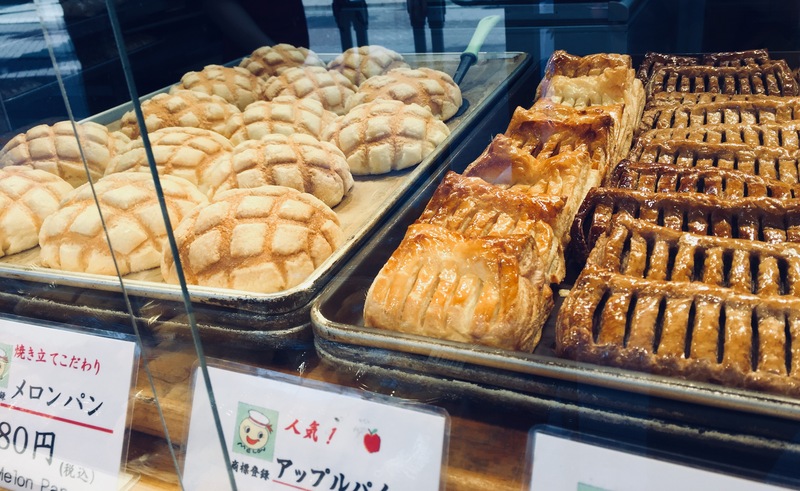 Based on the itinerary by Digi Japan, we started at exit 7 and headed to one of the tiny bakeries that specialises in Melon Pan – or melon bread. It looks like a melon, but tastes nothing like it. Go figure. The Japanese are sticklers for aesthetics. I’m not big on melon-looking bread, so I got an apple pie. It was good. Not too sweet. 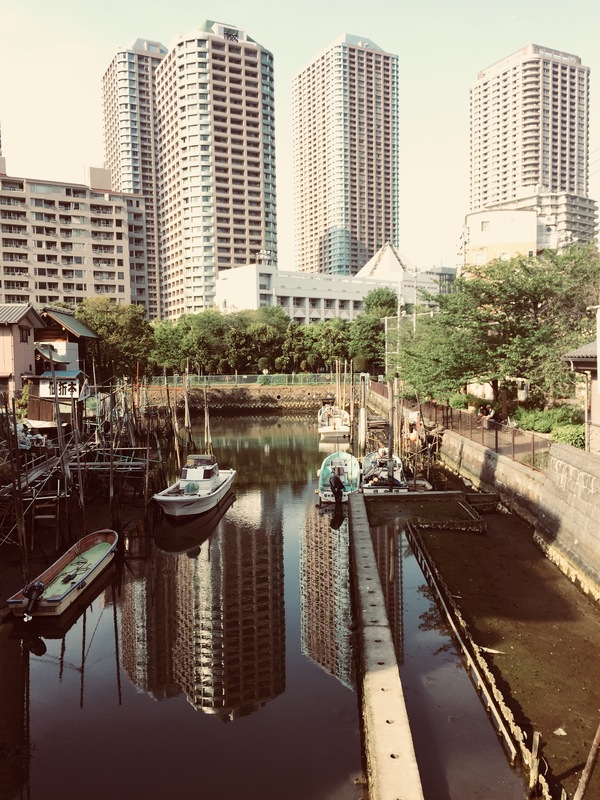 And then we took a walk around the neighbourhood where high rise residential buildings and old shrines live side by side much like the many other areas in Japan. But there’s a serenity and calm in this neighbourhood that’s missing in much of Tokyo. It’s got none of that frustrating Tokyo rush. I can’t say I want the tourists to find out about this place. Tsukishima – or moon island – is a manmade island that’s around 10 minutes away by train from Tokyo Station. And it’s worth checking out if you’re bored of the same old Tokyo sights. A wee walk away from the main shopping street, we find the large canal with a pretty neat view of Tokyo. It was a warm spring day so we found a shaded spot under a tree and just lay back, watched the birds and talked for hours. There’s something about being by the water that just brings me peace. My feet in the soil. My body at one with the earth. I’ve missed hanging out by the water and doing nothing but chilling. So we went to Kondo, a casual restaurant tucked away in a small alleyway. 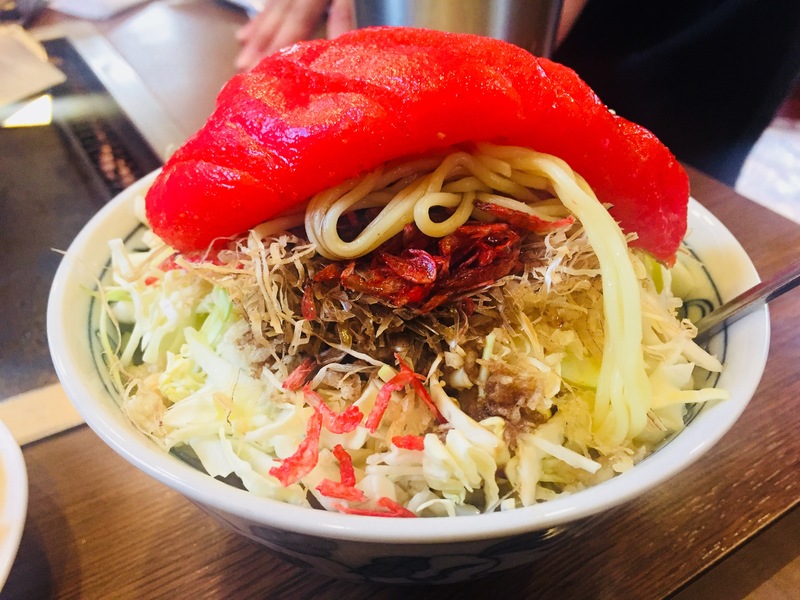 It’s easy to miss if you don’t know what you’re looking for – especially since there are many monja places on the main street. It’s only 5pm when we get there, but there’s already a queue. It moves fairly quickly and we’re seated within 15 minutes. It’s one of those places where you have to sit on the floor, so I’m glad I was wearing jeans. 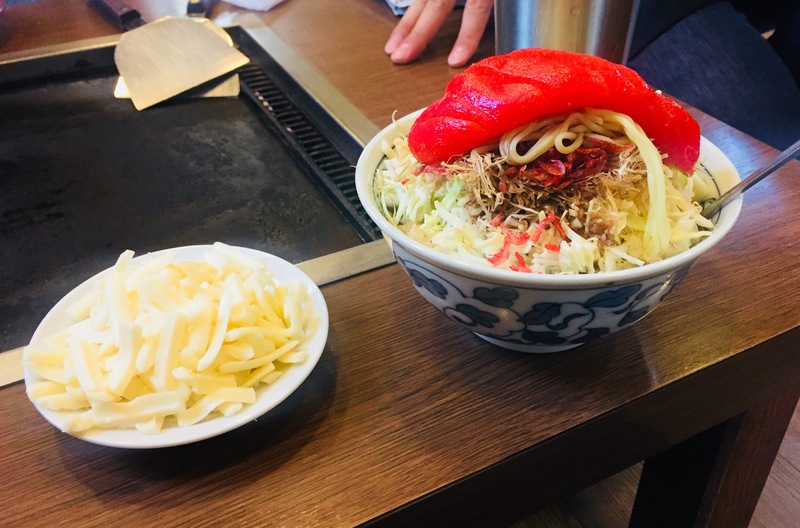 The first monja we ordered was mentaiko fish eggs with cheese – a fairly traditional and popular topping. We acted like silly tourists and got the waiter to prepare it for us. He made a circle with the hard ingredients, smashed it all up and then poured the very watery batter in the middle before smashing it up again. And then you wait a minute or two and it’s ready to eat. It looked like baby food on a hot plate. Can’t believe they serve this stuff to adults. And then you take the mini spatula and slowly slide a little bit over the hot plate till it’s brown and slightly crunchy. You have to do it a little at a time and very very slowly if you want to get the desired results – slightly burnt and crunchy baby food. The whole experience is pretty damn mendoksai troublesome. When I take my first bite, I like it. It’s much better than the one I had the first time around. The flavours are fairly mild so we douse it with chilli flakes, seaweed and fish flakes. It takes us close to an hour to get through the first one. And then we order a second round. This time we get one with pork, garlic and jalepenos. This one is much heartier than the first one. But it’s still fairly mild so we douse it with condiments again. It was an adventure. It was an experience. I’d gladly do it again. But frankly – I prefer okonomiyaki. 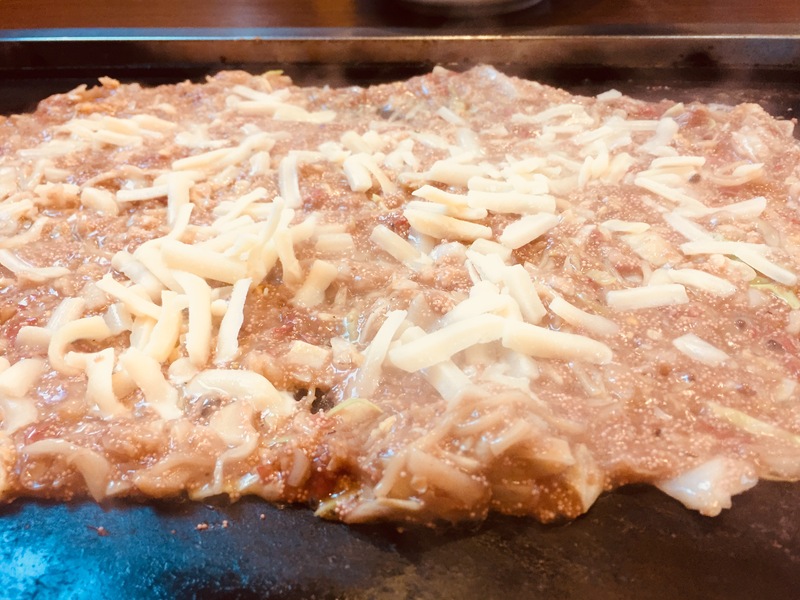 Monja is for babies. Till next time – stay young.